Google loves to hide behind the idea their search results are simply determined by "algorithms" -- that's a lie and hasn't been true for over a decade. Here's examples they listed for manual intervention to override their algorithms. What Eric Schmidt said in that interview was a lie. Google these days cuts off search results on the same topic under the guise of preventing clutter. That's a complete lie. Google has been manually editing search results since at least 2004. A search today for the term shows the site doesn't appear in 19 pages of results (at which point the results cut off). This is just touching the surface of Google's bias. Breitbart's Allum Bokhari had great article on Tuesday highlighting much of their internal bias as well. When you conduct a Google search, chances are you�ll see a Wikipedia link at the top of your results, or information from Wikipedia in the �knowledge panel� that appears on the right-hand side of some Google searches. The online encyclopedia is heavily favored in Google search results. The online encyclopedia is also infamous for its unreliability and far-left bias. Editors on the site added ICE detention centers to a Wikipedia article on �concentration camps.� They added Donald Trump and Tucker Carlson to a list of �neo-Nazi conspiracy theorists.� They even created an article dedicated solely to criticism of the President�s handshake style, and featured it on Wikipedia�s front page. This is the �encyclopedia� that Google relies on for many of its top search results. This caused a lot of outrage in the early days of the internet because Wikipedia's editors often simply lifted the exact content of the top ranked web pages on Google to fill in their encyclopedia, then Google gave Wikipedia higher results than the source article. The amount of censorship is so massive it would probably take years for someone to expose it all. What matters is Google has become a natural monopoly and is using its power to rig the midterms for Democrats in the hope of overthrowing President Trump. They probably could have gotten away with it if they didn't put the censorship into overdrive, but President Trump has signaled he's getting ready to move against them. 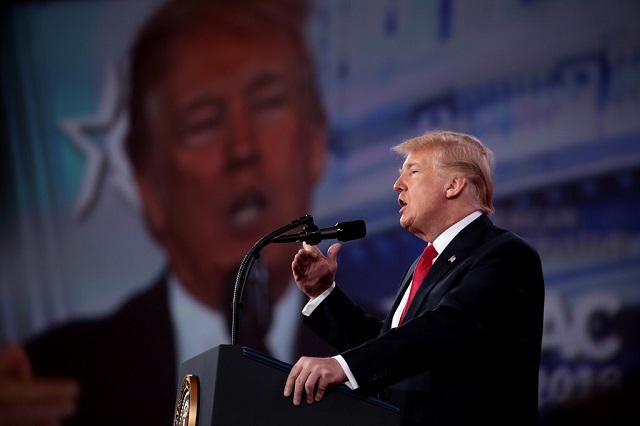 BREAKING: Trump said some people see an �antitrust situation� with Google, Facebook and Amazon. "There's a thing called free speech rights," Trump said at his rally Thursday in Indiana. "You look at Google, Facebook, Twitter and other social media giants and I made it clear that we as a country cannot tolerate political censorship, blacklisting and rigged search results." "We will not let large corporations silence conservative voices," Trump said. "We're not going to let them control what we can and cannot see, read and learn from," he said. "America's a free country and we're going to stay always a free country!"